The reality of Palestine’s long history from the Bronze Age to the present has been lost behind the myths of the Bible. Think of Palestine’s past and images of Israel displacing the Canaanites from around 1200 BCE, establishing a united kingdom, even an empire, under King David and then his son Solomon slip easily into our minds. We think of the divided kingdom: apostate Israel in the north ruled from Samaria and Judah in the south with its Jerusalem temple. We know these kingdoms were removed by the Assyrians and Babylonians by around 600 BCE and that the Jews returned once again after a period of captivity. And they re-returned to “the land of their fathers” to “re-establish the Jewish State” as proclaimed in Israel’s Declaration of Independence of 1948. The historical right of the Jews to the land of Palestine remains evident today to possibly most Christians and anyone taught this historical outline. The question we might ask, then, is what is the history of the Palestinians? The biblical narrative leaves them no room for a history in the land. Are they late trespassers? Are they rootless Arabs with no genuine attachment to any land in particular? Until his retirement Keith Whitelam was Professor and Head of the Department of Religious Studies at the University of Stirling and Professor and Head of the Department of Biblical Studies at the University of Sheffield. 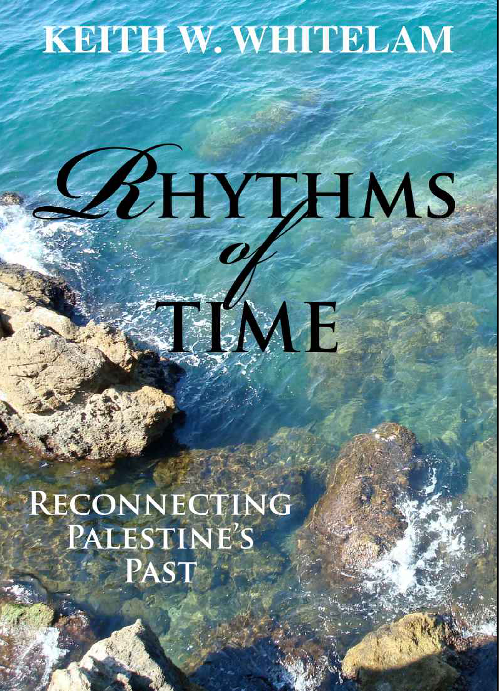 His recent publication, Rhythms of Time: Reconnecting Palestine’s Past, surveys the archaeological evidence for the history of Palestine from the Bronze Ages through to the end of the Iron Ages and compares what he sees with the Palestine from more recent times according to travelers’ reports and current geo-political maneuverings. He concludes that our Western view of Palestine’s history has been determined by the biblical narrative and conflicts with the archaeological evidence before us. The past matters because it continues to flow into the present. However, Palestine has been stripped of much of its history in the nineteenth and twentieth centuries. It is as though Palestine only came into being with the British Mandate (1920-48) and came to an end with the declaration of the modern state of Israel (1948). The growth of towns, the shift in villages, or the population movements of three millennia before have become divorced from this ‘modern’ Palestine. (Kindle Locations 42-46).